Each participant will receive a Technical t-shirt (not cotton), goody bag and the all-important medal. Just like the half marathon and 10k in 2018, you’ll get the chance to run over the Itchen Bridge during your race journey. At the top of the bridge almost 100ft up, you’ll experience a feast for the eyes with the beautiful view of the city, the River Itchen, commercial centre and out to sea towards the Isle of Wight. This event is an ideal choice for first time Marathon runners and an exciting new course for seasoned pro’s alike. Southampton City Counsel are offering all athletes an ALL DAY pay and display ticket at West Park Road Multi-storey Car Park for GBP 2.50. The Race Village is located here so it will be buzzing with excitement as the runners do their warm up countdown to the start and then head off. Once the runners have gone there is plenty of entertainment coming on our big screen as you can watch live footage, see interviews with runners and then the Awards presentation to Winners at 1230. Pop into town for a drink, snack or bite to eat! Directly in the middle of the Guildhall square, our fabulous host will be keeping the spectators entertained and welcoming the runners across the line! There will be food and drinks available here and you can head to Sprinkles for Ice cream after! Timings: 0900 – 1400 for all runners! As a marshal, you will be stationed around the course to help ensure the smooth running of the Marathon, Half and 10K! If you sign up to be a marshal, not only will you get to be a part of the day events you will also get a free entry to one of our events next year. So if you are looking to defer to next years event this is the best way to do so. We will send out a code a few weeks after this year's marathon to all marshals entitling you to 100% off entry for an event next year! Contact the ABP Half Marathon for more information. First time of doing the southampton marathon on a very hot day.Course had a lot of uphills thats seemed to go on and on.Very hot day needed a LOT more water stations around the course and i would like to praise the local people who provided Extra water stations, paying for the water themselfs and for bring their water hoses out!Start could of benifited with starting pens as spent the first half running around slower runners.i did enjoy the race the bridge was a masive challange with some nice views aound the course, felt the race would of been better in reverse. 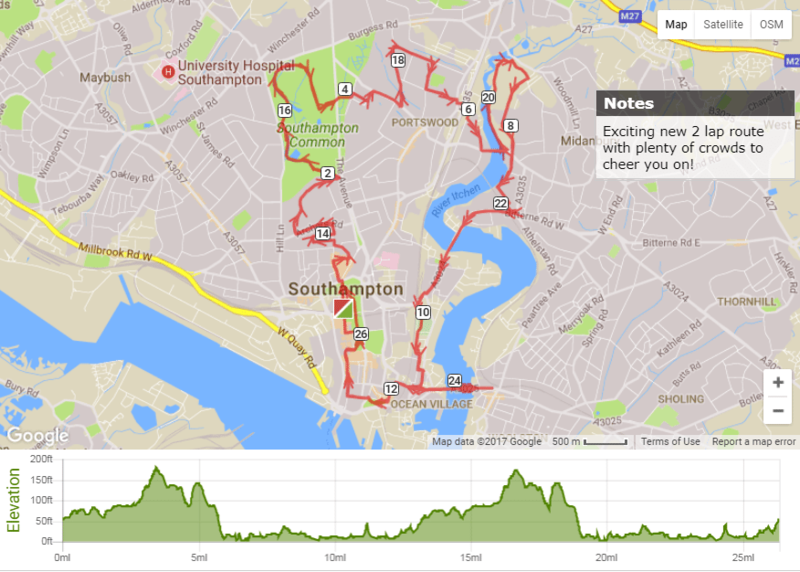 An enjoyable and scenic course for a half marathon, the route takes you through the city, out over Itchen Bridge across the estuary (a real highlight) and back again through the iconic St. Mary’s Stadium. From then on through some wonderful urban parks and residential areas before heading back towards the Race Village at Watts Park in the city centre.The Race Village was buzzing with lots of charity marquees, there didn’t appear to be quite enough toilets for the 10,000 runners participating, with huge queues still evident moments before the race. Baggage drop and collection was fast and efficient, situated at The Guildhall next to the Race Village.There didn’t seem to be a staggered start evident, we were all set off as one huge hoard, which creates problems with slow and fast runners being tangled up. Water stations were evenly spaced at miles 3, 6 and 9 with plenty for everyone but given the heat on the day, shower units were a key asset missing from the race.Local support was incredible with thousands out to cheer on the runners, especially in the residential areas where spectators obliged with jelly babies a plenty.The medal is a fine addition to any hanger, the goody bag is standard though a decent technical t shirt is included.In all, I would certainly recommend this for the half marathon but the full was just another lap around. Definitely do the Half once though. Thus is the third time I have run the half marathon. The first time under the new route and absolutely loved it. The atmosphere was incredible, the marshalls helped out and the public support was the best. So many locals out and cheering. Made the run so much more enjoyable.Thank you for organising such an amazing race. I will be signing up again next year. Second time; lots of bottlenecks in the first 4miles - all the pacers seemed to be congratulated around the start line and then disappear into the running crowd. Yes I know must of use have smart watches, and yes I did see that they had orange t-shirts on, but other races have small banners to easily recognise them. When they’re huddled by a small group of people they just become part of the crowd. 3rd time I've done the half. Each time the course has changed. Easy to get to by train or road. Easy bag drop off. This year the half and full set off at the same time. Chaos!! Not enough toilets and too many people in one area. The start was bad. Nobody could work out how to get into the start so we all climbed over the barriers. All mixed in together so no chance of finding a pacer. Really could of done with runners let off in sections. First couple of miles quite congested and having to pass very slow runners who had probably through no fault of their own ended up at the front. Quite a hard course with lots of bridges and hills but good if you like a challenge. Well marshalled and plenty of water stations and one gel station. It was a really hot day and a lot of residents out with extra water and hosepipes. Bit of everything, city centre, rivers, bridges, parks and a run through the football stadium. Despite the problems at the start I will definitely enter again and I hope the organisers take note of feedback. Whilst I’ve run half marathons in training, this was my 1st half marathon race. It was well organised, easy to access and the course was suitable for everyone. In view of the heat on Sunday, I’d like to have seen 1 extra water station as it was a slog in the 2nd half with the 2 early on. Recommended.